It’s been a couple of years or so since I posted a gratuitous bread post and picture on my little corner of the web. This particular one is just so beautiful that I had to post it up here and use it as a desktop wallpaper as well. This also gives me the opportunity to praise this inspiring and freaking gorgeous book from the Keller/Ruhlman team, Bouchon Bakery. The credit here also goes to the pastry chef and master baker for Bouchon Bakery, Sebastien Rouxel and Matt McDonald respectively. reading through it I literally want to make and consume every cookie, tart, cake, pastry, confection and bread recipe! It’s one of those inspiring books that makes one want to jump in and start baking. That should be no surprise though since the previous installments in this series were all fantastic from the classic The French Laundry Cookbook to the approachable Ad Hoc at Home. I know I will be making puff pastry soon and certainly trying out Bouchon’s croissant recipe to see how it stacks up to my latest favorite. This first recipe I tried is this simple Pain de Campagne (country bread). It’s made with levain (liquid sourdough starter), all purpose flour, rye flour and whole wheat flour. Master baker McDonald instructs us to mix in the mixer on low for 20 minutes, longer than I’ve ever mixed a dough I think and then allow for a long 4 hour or so rise with periodic folds of the dough. I deviated from the recipe in the manner of baking though. I baked the loaf, like most loaves I prepare now, in a Le Creuset pot as opposed to on a baking stone. Really, if the loaf fits in my oval pot I bake it in there. It traps the moisture and gives the loaf a brilliant crust that is glossy, crackly and has just the right thickness. Salmon was the first meat I ever salt cured back when I got Ruhlman’s book Charcuterie. It’s one of the easiest of the cured meats because it requires little investment and very little time compared to a Bresaola or a cured fermented sausage like salami. Basically all you do is rub a salmon fillet with a mixture of salt, some sugar, aromatics and maybe a few tablespoons of vodka or another alcohol. You let it sit for 24 to 48 hours in the fridge and then wipe away all the cure ingredients and pat it dry. Now it is ready to go as is, basically a gravadlax, sliced thin on a bagel or some rye bread. Another option is to maybe smoke it (cold or hot) after it is cured. Diana loves it hot smoked quickly till cooked (I use my wok for that) and served with a simple slaw, crostini and a sour cream/mayo sauce. Yet another way to take the cured salmon to the next level is to brush it with a glaze of molasses and sprinkle it with a mixture of caraway, pepper and coriander. This makes a unique pastrami salmon! This time around, I borrowed an idea from Jamie Oliver where he cures salmon using a mixture that includes beets and horseradish. 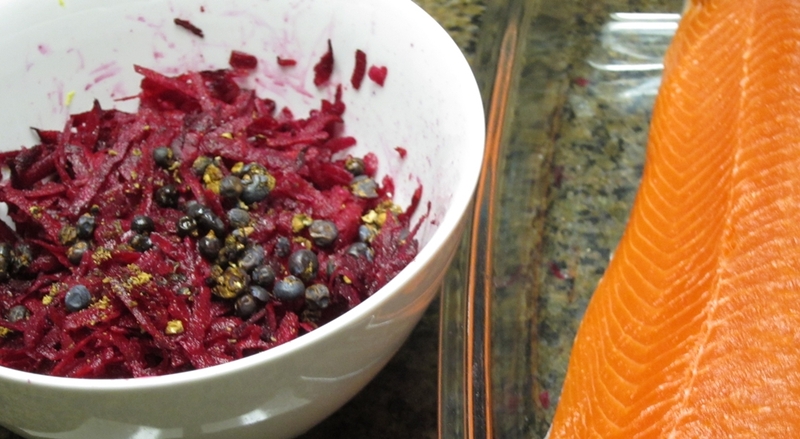 The fish had that crazy funky red color from the beets when he prepared it and it just sounded like a good idea. 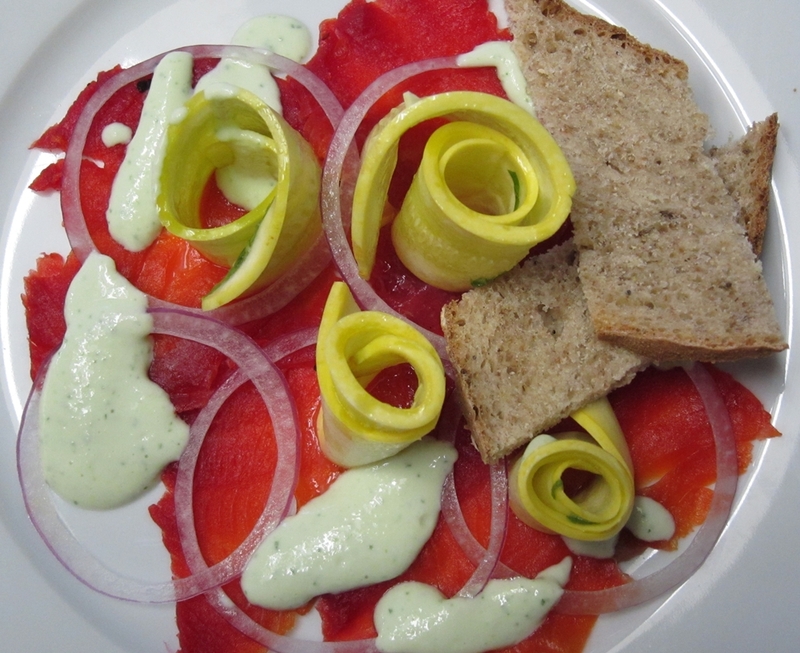 To actually prepare it though I used the proportions from a Grapefruit-Cured Salmon in the Modernist Cuisine books. They use grapefruit zest, lemon zest and juniper. I just eliminated the grapefruit and kept the lemon and juniper. The copper river salmon I used had an amazing color when done curing and all the flavors worked great. I could taste everything, from the citrus zest to the earthy beets. We ate it for dinner and/or work lunch over about a week period. One way I served it was with some quick lemon-marinated zucchini and red onions. 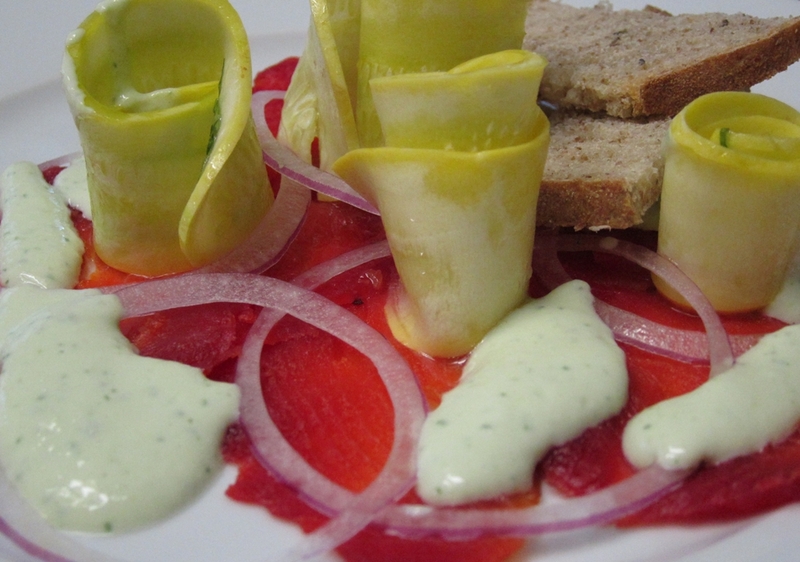 For this dish I made a sauce from pureed chives, cucumbers, yogurt and sour cream. 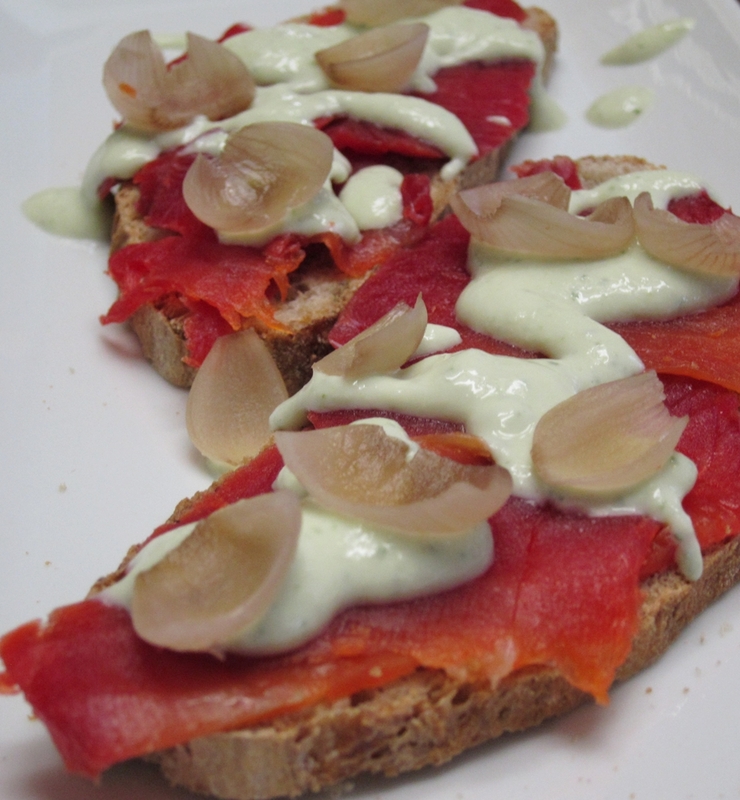 For another quick dinner I topped home-baked rye bread with the salmon, added some pickled pearl onions and drizzled with whatever was left of that cucumber-chive-yogurt sauce. 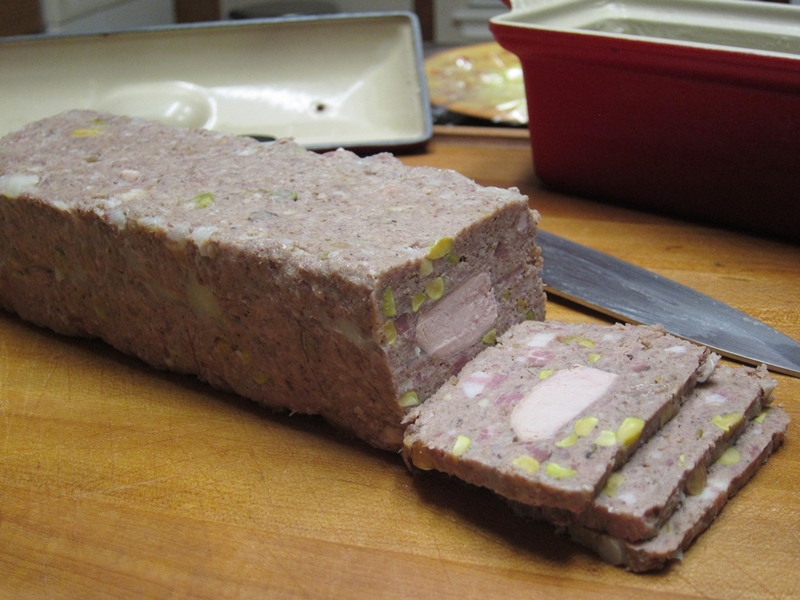 Making terrines is such a satisfying process. I love every aspect of it. I start by selecting the meat, in this case it’s the meat from two pheasants that a friend shot in Kansas. Next is figuring out what kind of terrine this is going to be. It could be very coarsely ground (or hand chopped), homogenous, smooth and spreadable (making it a Paté), or, as is the case here somewhere in between. I reserved the breast halves from one of the pheasants and ground up all the rest along with pork back fat and a host of flavorings and spices. 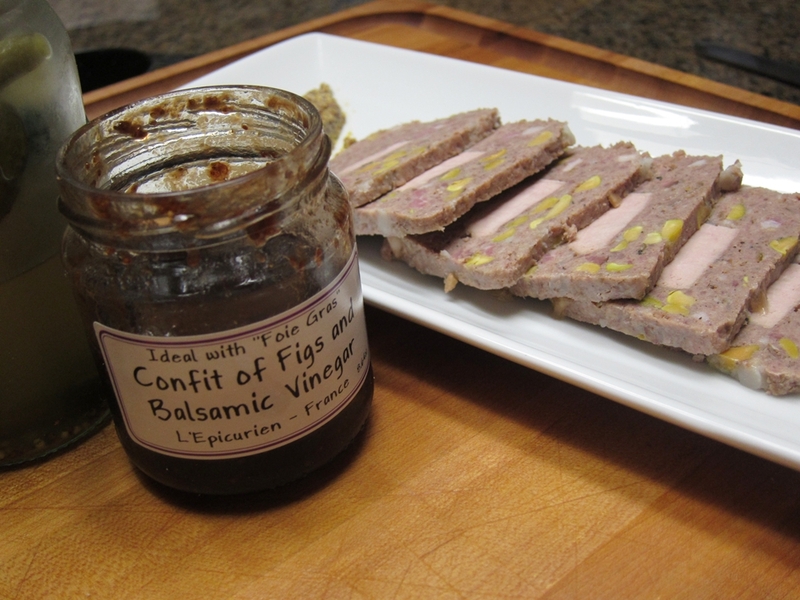 The recipe is based on a formula in Ruhlman’s Charcuterie. I also usually reference Time Life series’ Patés, Terrines and Galantines for ideas and inspiration. 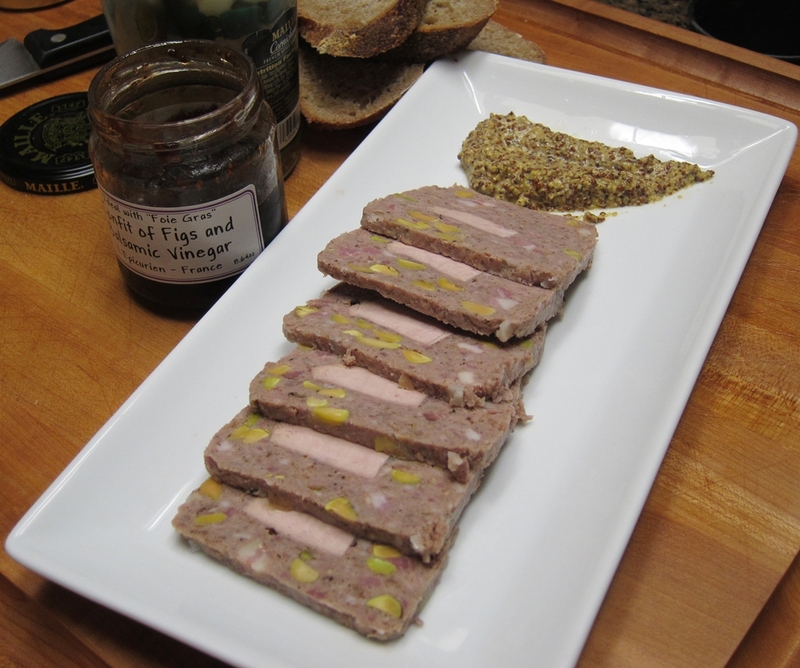 The reserved pheasant breast became the inlay in the terrine. For more textural variation and definition I mixed in some blanched pistachios and finely diced bacon. We feasted on this for a couple of dinners and a few lunches at work with several condiments like mustard and chutney and ALWAYS…cornichons.